In our last piece (it was on male incomes since the Great Recession) we promised you we’d revisit the topic and chart female incomes by age since the recent Great Recession. Don’t ever let them tell you DQYDJ doesn’t follow through on their promises! So continues our little journey through the IPUMS-CPS microdata. We’ve been attempting to get a grip on the inflation adjusted earnings – or spending power – of every age for both genders since the recession – yeah, it’s ambitious, but somebody’s got to do it, right? Just as a reminder, our definition of ‘worker’ differs from the official definition. If someone reported working a week and working on average 1 or more hours a week, we count them as ‘in the workforce’. You can see that the definition we are using might have interesting results during recessions, as more people attempt to enter the workforce to help their families, but by the time we are talking medians and 90th percentile incomes (as we are doing), it should mostly even out. And, of course, we are attempting to find “Income by Age” – but not really income… more of an estimate for “Spending Power“. That means we are removing taxes from income, and adding things like tax credits, benefits, and transfers. Just as if I give you $100 in food (that you’ll eat) you won’t have to buy $100 in food, this is a more appropriate way to measure spending power than simply ‘income’, especially in a time with more people receiving benefits. It is also how the Census Bureau attempts to calculate supplemental poverty. Please see our initial piece (linked in the quote above) for more detail. 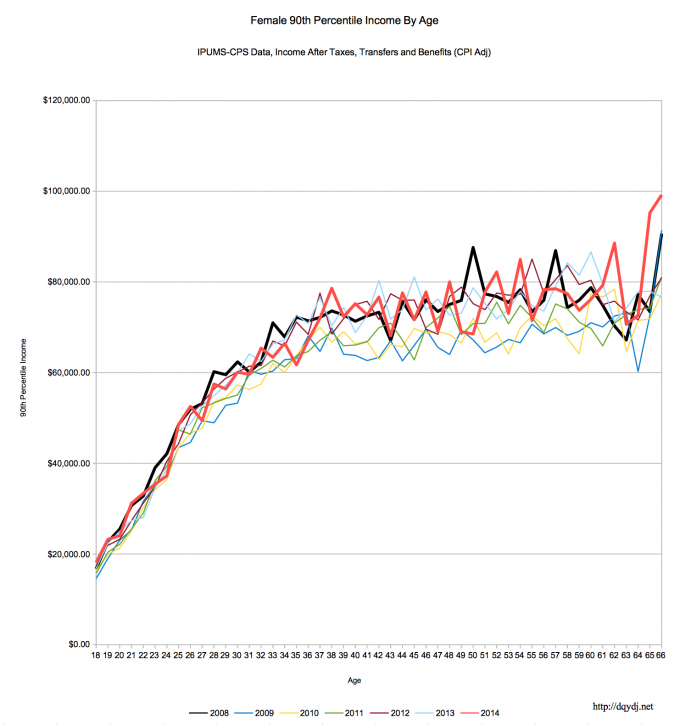 And our final caveat – these are survey years, but not the year income was actually earned. The questions come in March, so the respondent should be in the middle of – or done with – taxes, and able to give a good response for what they earned in the previous year. If that isn’t clear, I’ll put it this way – 2008, for example, is the respondent’s earnings in 2007. 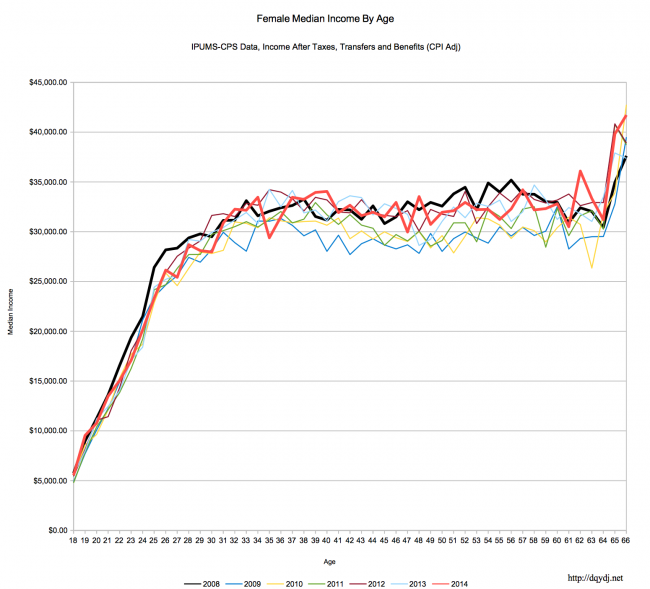 So, let’s zoom into female incomes since the Great Recession! Judging from the data that we now have on roughly the last 7 years of spending power for males and females of different ages, we can make some interesting conclusions. High earners have kept their spending power… high… for both males and females, and females earning around the median have picked up where they left off. Male median earners have suffered (and continue to suffer). We have some theories on this; a good summary of our thoughts and data mining came in our article on how a shifting industry balance points to a greater decline of employment in industries which were traditionally male dominated – like construction and manufacturing. Contrast that with the growth of service industries (mixed employment) and the explosion of informational industries (high earners) and you’ve got a good theory. Here’s that link to the male piece again. Of course, it does lend a hand to the theory that the middle class has been affected greatly – at least, the male middle class who were traditionally (but not universally!) the breadwinners of middle class families. We’re interested in hearing your thoughts – why isn’t this getting more press? How would you ‘fix’ it? Will it, perhaps, be self correcting as new workers choose which industries to enter? How about displaced workers?